Bookies say Jim McIntyre and Gordon Strachan are in a two-horse race to succeed Neil McCann in charge of Dundee. Former Scotland football manager Gordon Strachan is set to return to the city where he started his career with an after dinner speaking date in Dundee. The two Dundee/United derbies earlier this season certainly caught the imagination of the City of Discovery footballing public. Gordon Strachan's reign as Scotland head coach has ended. POLL: If Gordon Strachan leaves, who should replace him as Scotland manager? 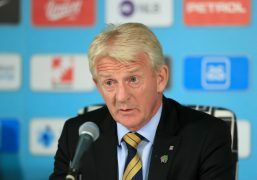 After Scotland failed to qualify for next year's World Cup, there is speculation that Gordon Strachan may leave his post. An expert has refuted Gordon Strachan’s claim the Scottish national football team is “genetically behind” their competitors following their failure to qualify for the World Cup finals. As he turned 60 this week, Scotland boss Gordon Strachan is a figure who divides opinion. My forecast of an England win unfortunately came true last Friday and no one is more disappointed than me with the result. Footballer Charlie Adam has claimed his "face does not fit" in the current Scotland squad and believes Gordon Strachan is not choosing the best players available to him. Scotland boss Gordon Strachan has welcomed Scott Brown's decision to come out of international retirement after naming the Celtic skipper in his squad to face England in this month's crunch World Cup qualifier. Midfielder Scott Brown is on the verge of making a shock international comeback at Wembley, it is understood. Scotland boss Gordon Strachan will go to Wembley next month with hope despite the 3-0 defeat by Slovakia in Trnava on Tuesday night. I’m a little less confident than my former team-mate Lee Wilkie on Scotland’s chances in their next two games. Scotland manager Gordon Strachan was at the St Johnstone-Hearts game and must have been impressed with Saints’ young keeper Zander Clark.